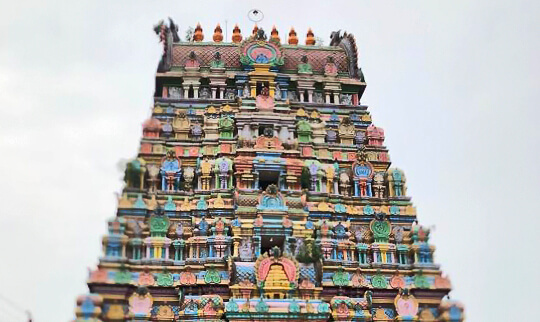 Vaitheeswaran Koil temple is dedicated to Lord Shiva, located in Tamil Nadu. Shiva is worshipped as Vaitheeswaran which means "God of healing" and it is believed that prayers to Vaitheeswaran can cure diseases. In Tamil vaidya means Doctor and Ishvara means God/Master. It is one of the Navagraha temples associated with the planet Mars. People believe that taking bath in the Siddhamirtham tank and praying for Vaitheeswaran in wet clothes, will cure all the skin diseases. Vaitheeswaran Koil is also considered to be the best place to consult a Nadi astrologer also known as Palm leaf astrology, as it originated there. Apart from the main temple Vaitheeswaran Koil, there are temples within driving distances from the hotel. Tirupunkur or Thirupunkur lies about 3 miles west of Vaitheeswaran Koil and is known for Sivalokanathar temple (dedicated to Lord Shiva). The temple is associated with the legend of the Saivite saint Nandanar who was one of the 63 Nayanars. Since Nandanar belonged to a low caste, he was not allowed inside the temple. Lord Shiva asked Nandhi to move aside so that Nandanar can have darshan from the gate of the shrine. Sirkazhi is situated in Nagapattinam district, Tamil Nadu. The foremost of the Saiva Nayanars, Saiva saint Tirugnanasambandar was born here in the seventh century. The history of the town is centered on the Sattainathar Temple, dedicated to Lord Shiva. Three different forms of Shiva are worshipped in Sirkazhi - Bhrammapureeswarar, Uma Maheswarar and Bhairavar. 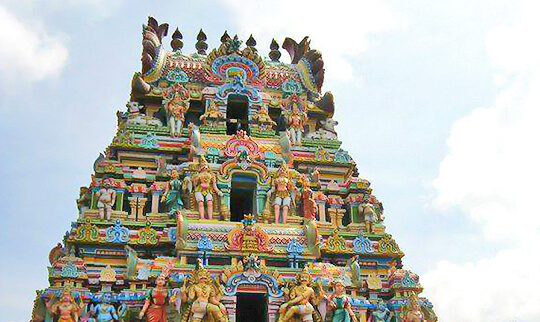 Konerirajapuram’s is famous for its huge bronze statue of Nataraja (Lord Shiva) at Uma Maheswarar temple. 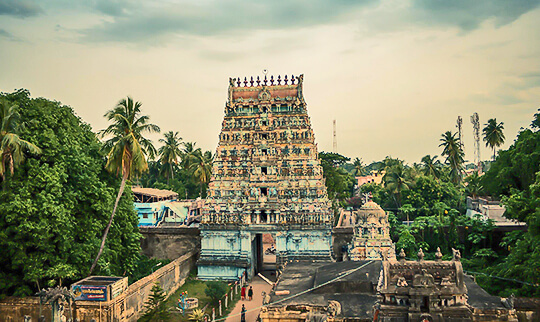 The temple is in the Nagapattinam district in the South Indian state of Tamil Nadu, dedicated to Lord Shiva. Here, Shiva is worshiped in the form of a lingam and his consort Parvati is depicted as Mattuvar Kuzhalammai. The temple was reconstructed by Sembian Mahadevi, Chola queen. The temple is just an hours drive from the hotel. 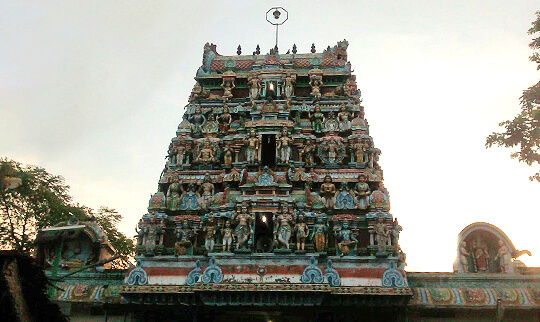 Tirumeeyachur Mehanadhar Temple is dedicated to Lord Meghanatha, located in Thiruvarur District - Tamil Nadu. The Goddess Lalitambika is the consort of Lord Meghanatha, the five feet idol of Sri Lalitambika is placed over Sri Chakra in the sanctum sanctorum. Goddess Lalitambika is said to be in Manonmani Swaroopa and hence is also known as Santanayaki. It is believed that Lord Lord Saneeswaran was born at this location and the curse on Sun (Surya deva) was absolved here. Koothanur is in the Tiruvarur district of Tamil Nadu, it is just 25 km from Tiruvarur. The temple of Hindu goddess Saraswati is situated here. 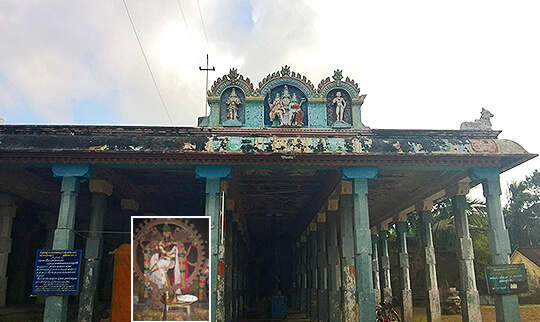 This is the only temple for goddess Saraswati in Tamil Nadu. Goddess Saraswati is known for the knowledge, hence people believe that if they worship this deity they will become good in knowledge. Vijayadashami is one of the prominent festival celebrated in this location. 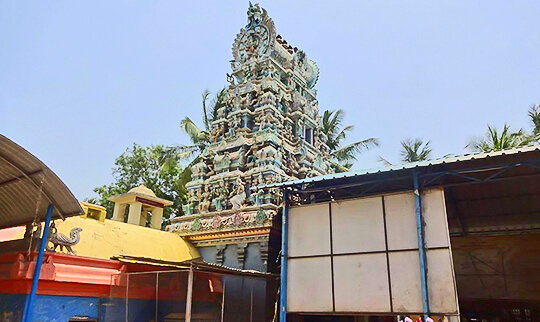 Vanamuti Perumal Temple is dedicated to Hindu God Vishnu, located at Kozhikuthi Village in Nagapattinam District of Tamilnadu. It is believed that worshipping this god offers peace, prosperity, happiness and wealth. The 18 feet tall god Vanamutti Perumal statue is carved out of a single Athi (Fig) tree. Mythology says that the Vanamutti Perumal appeared along with this consort and gave Vishwaroopa darshan to Maharishi Pippalar.